Description: Custom crafted of Solid Brass, stunning Oak leaves, acorns and branches adorn Beige Iridescent art glass complemented with hardware finished in Craftsman Brown. Oak is a common symbol of strength and endurance and its leaves symbolize rank in our armed forces. 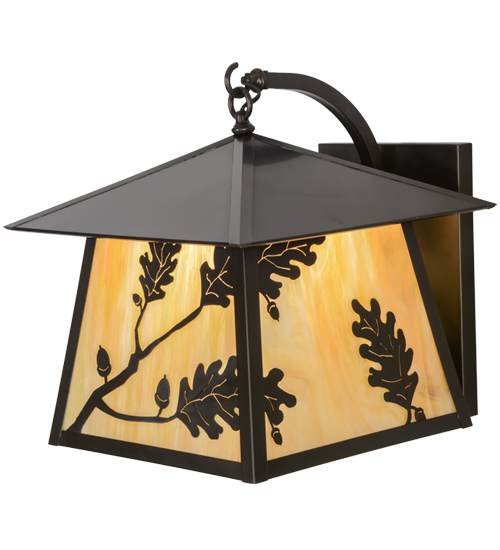 Rustic charm is revealed with this nature inspired Craftsman Signature lantern, the perfect wall fixture for indoor and outdoor lighting applications. Handcrafted in the Meyda facility at the foothills of the Adirondack Mountains in the US.